A professionally guided trip reasonably priced on a per person basis. Introduced by 1000 Islands Fishing Charters in 1981, half day Mixed Party Fishing trips have grown into the most popular form of fishing for visiting anglers. With its massive 200 sq. ft. of deck space, "A.B's OFFICE" is capable of carrying up to 15 anglers and is the only U.S. Coast Guard Certified fishing boat on the St. Lawrence River, undergoing annual Coast Guard inspection to insure your safety and comfort. It is decked out with the most modern electronics, including radar, GPS and chart plotter for pinpoint navigation regardless of weather conditions, and full color and 3-D video sonars for finding fish. We also provide tackle for anglers consisting of state of the art, top quality Shimano 6 1/2' medium-light rods and spinning reels spooled with 8 lb. line. We spare no expense to make your trip as successful and memorable as possible. Our booking office is available year around on our toll free number and the experience and knowledge of our office staff and crews has earned us our proud reputation. Advance reservations required. Sorry, no "walk-ups"
Reservations are necessary and are on a first come-first serve basis. 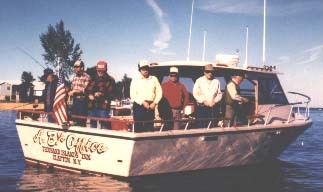 Minimum of six anglers total required in order to go with your own party helping make up the six. 14 or less days prior to departure, unless the space(s) can be rebooked. please contact us at 1-315-686-2381 between 9 A.M. and 6 P.M. (Eastern time).